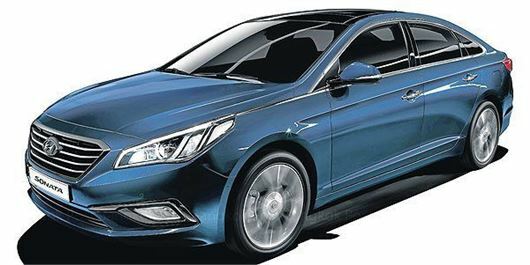 Hyundai has announced a restyled Sonata model for the Far East market. The Sonata is sold in the UK and Europe as the i40. This represents a marked change from the corporate front end that was gradually applied to most Hyundai models from the introduction of the i40 Tourer in the UK in 2011. Though a bigger car, the remainder of the 7th generation Sonata maintains the familiar 'Fluidic Scupture' of its predecessor. At 4,855mm it is 30mm longer than before, now with a wheelbase of 2,805mm and at 1,865mm is also wider. Engines in the Far East are basically carry-overs of the 168PS 2.0 litre and 193PS 2.4 litre direct injection petrol units. (In the UK all i40s are powered by the same 134PS 1.7CRDI diesel engines). No word yet on whether the new car and the new styling will find its way to the UK.